It's 4:30pm on a Thursday and I'm heading down to this photo shoot for a car that I've never actually seen in real life. I mean I've seen crappy phone camera pics of this car and I knew it was yellow, but somehow the yellow doesn't quite hit you until you take off your shades and see it with your own eyes; I pull into the parking lot and think out loud "Damn that's bright!". Jody grins and says "wha? I wanted something different!". You know there are some guys who alot of people wait in anticipation to see what project they're comin out with next? Well Jody is one of them. He's had quite a few project cars along the way: his Evo 4 set an AWD 1/4mile record at one point in T&T and his black S2000 and his red S14 Silvia have been known to decimate a truckload of tyres at drift practice. There is always something in the works and its always JDM, maybe that's because he runs his own roll-on roll off company, DreamCarz Ltd. which gives him and his customers access to all the racing goodies coming out of the best tuning shops in Japan from places like Osaka and Tsukuba. 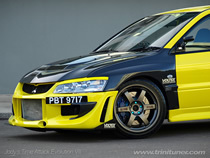 Time attack cars are known to let form give way to function and after you get over the dazzling yellow, the first thing you take notice of on Jody's car is the Voltex aerodynamics. This car looks downright badass! The wide body fenders, bonnet, trunk and rear spoiler are all Voltex carbon fibre with the fenders utilizing the extra width for a functional air guide at the sides. For additional air on the twin HKS oil coolers, a pair of black scoops were added to the Gialla front bumper, which also sports Voltex aluminum side splitters at the base. The side skirts and rear bumper were ordered from Do-Luck since Jody thought they'd fit in great with the look of the car along with a pair of APR GT racing wing mirrors, too tiny for my taste. A vortex generator from Ralli-Art finishes off the top and lets the spoiler do its job. Building this car to compete at a dexterity racing event like solodex, Jody decided to spend less effort on increasing horses and spend much more on brakes and suspension. This is a great strategy. Up front he changed the already powerfull Brembo 4 piston calipers and rotors for Endless 6 piston calipers and larger 2 piece rotors, at the back he left the 2 piston Brembo's. All around he beefed up the suspension to a fully adjustable Zeal set up, utilizing a longer shock stroke and stiffer rebound, similar to a real touring car. A Cusco underbrace and rear strut tower braces keep everything tight and allow this car's cornering to be sharp as a tack. One last suspension related mod: fitting up a set of famously ultra light 18"x9" Volk Racing TE-37s. How do wheels affect suspension? Lighter wheels offer much less unsprung weight to the four corners of the car and put less strain on the suspension parts, not to mention less inertia to allow those massive brakes to work even better. Jody opted for the limited edition titanium coloured Volks which accounts for nothing more than ego building and wallet emptying. We like it! The list of engine mods seems paltry by comparison: HKS intercooler and turbo piping, in and out, and a HKS air filter. Nothing more, as mentioned before, tuning for solodex is not about horsepower or top speed as much as it is about handling and agility. Its not that the car has no power, it is a 4G63T after all and to keep things in check a HKS F-CON helps to fine tune what the ECU is doing. A HKS twin disc clutch makes sure that as much of that power gets to the drivetrain. A HKS downpipe and 3" HiPower exhaust sees to it that all the air that gets sucked in has an easy way out after combustion. Nothing was really done to the interior, the stock Recaro seats are more than adequate for solodex and no rollcage is required either. The stock steering wheel was left in since it's one of the few metal MOMO wheels that incorporates an airbag; a safe choice since this is also a daily driver at times. A Ralli-Art shift knob and 3 HKS gauges monitor water temperature, boost and oil pressure. That's it! No really, we couldn't even find an air freshener! Usually Jody's cars are works in progress. But he claims this yellow Evo 7 is completed, just waiting on the final tune by Peak Performance. He is already looking at his next project in the line up - a fully built, widebody, Subaru Impreza STi circuit racing car, which he plans to race in Barbados, Jamaica and Guyana. But as you can tell, that's a whole other story and right now I'm still tryin to get over this shade of yellow!